Not sure which wheel balancer you need? Compare all balancers We Can Help! Wheel balancer perfection comes from Ranger. After over a decade of developing our balance technologies, our wheel balancers have reached the very pinnacle of reliability and precision. The proven direct-axis drive system is accurate within hundredths of an ounce and guarantees that wheels are balanced and vibration-free. Wheel balancers are essential tools for professional auto care centers and tire shops of all sizes. 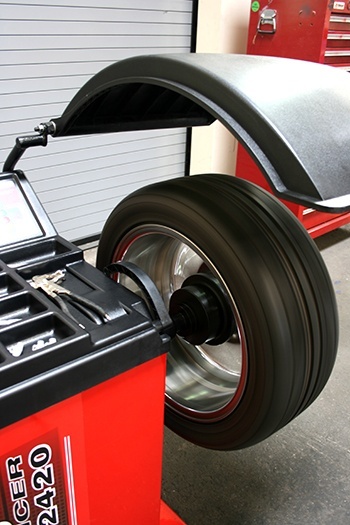 Wheel balancers are essential tools for automotive shops of all sizes. They pay dividends over time and make sure you keep up with fast-paced customer demand. Top five reasons to put a quality wheel balancer in your shop. Starting at $3170 + FREE SHIPPING! Starting at $2095 + FREE SHIPPING! Starting at $2255 + FREE SHIPPING! Starting at $3135 + FREE SHIPPING! Starting at $2580 + FREE SHIPPING! 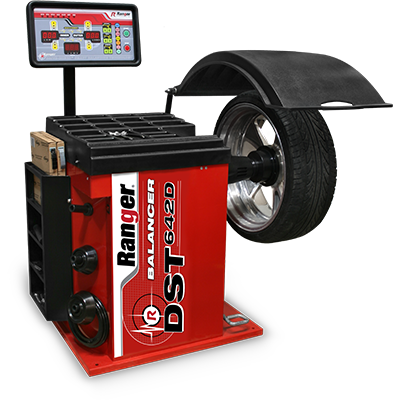 The Ranger RB24T truck wheel balancer is specially suited for high‐volume commercial tire dealers and truck fleets. Most bargain brand balancers on the market are simply standard balancers with larger mounting cones. The RB24T is a real truck balancer with real fast startup and braking speeds. Starting at $7880 + FREE SHIPPING! Worried that your garage is too small to fit an efficient and extremely accurate wheel balancer? Look no further than the DST-30P. This is a hybrid design that features a magnetic transducer encoder with twice as many teeth as the DST-2420, taking the count from 32 to 64. As a result, this wheel balancer doubles the number of possible weight placements. This means more accuracy and better balancing. Plus, its smaller footprint makes the DST-30P ideal for small or cramped shops. Of course, the RB24T truck wheel balancer and DST-64T model are also perfect for highly active shops looking for a little extra pep from their calibrations. 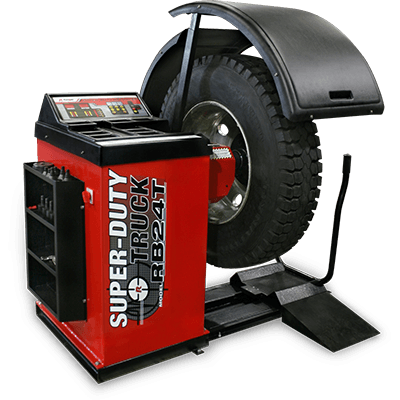 The DST-64T, in particular, is fully automated, featuring our DataWand™ technology that automatically provides all tire dimensions for you. An accurate balance doesn’t get easier than this! 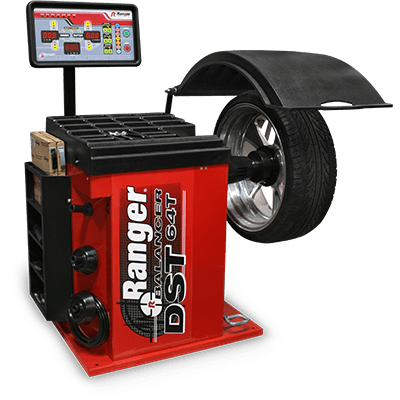 No matter which model you choose, every Ranger wheel balancer features heavy-duty steel body construction and dependable electronics. We supply superior wheel balancer features, like a simple ergonomic design and a complete accessories package. This includes a comprehensive truck cone kit. 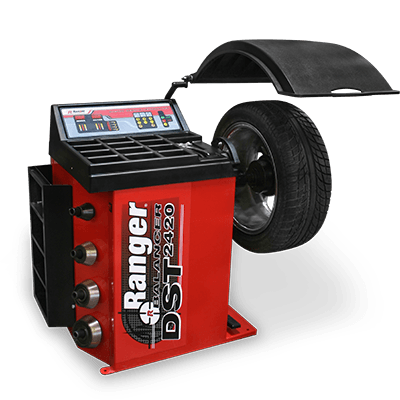 Ranger's exclusive direct-axis drive system and user-friendly settings make up the best wheel balance technology ever made. 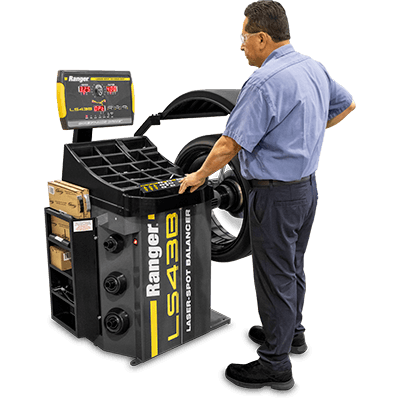 Best of all, your Ranger balancer removes the guesswork from every balancing job. No matter the tire diameter, it only takes about six seconds for the wheel balancer to tell you exactly where to place the weights. The machine will automatically calculate the minimum amount of weight needed to achieve the perfect balance. It will even save your measurement settings for an entire set of wheels. Because each machine is engineered with a robust set of user-friendly features, your balancer may just be the most sophisticated piece of equipment in your shop. After all, you're a tire and wheel specialist—you shouldn't have to be a computer whiz, too. Our easy-to-read display panels and simple ergonomic controls let you and your technicians immediately jump into the action with minimal training. 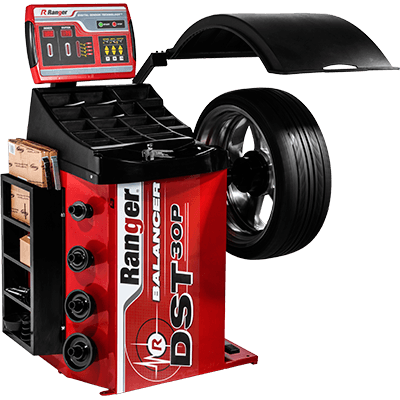 Ranger will help outfit your shop with the perfect balancer for your needs. Now for the best part: deciding which one is right for you. Use this guide to find the best wheel balancer for your tire shop or business.